Being a pet parent comes with a lot of responsibilities. Regular walks, routine checkups to the veterinarian, and giving him plenty of love and affection are all important parts of pet care. But there’s one aspect of caring for your dog that trumps all others: feeding him. Just like humans, canines require a well-balanced diet in order to ensure that they are well-nourished, healthy, and content. At first glance, feeding your furry pal might seem like a simple task, but with so many different dog food options to choose from, trying to make the best choice can seem like a daunting task. There are a wide-range of formulas on the market, like organic dog food, grain free dog food, and even dog food for sensitive stomachs. To make matters even more complicated, there’s a huge assortment of dog food brands to choose from. Blue Buffalo dog food, Rachel Ray Nutrish dog food Taste of the Wild dog food, and Natural Balance dog food are just some of the brands available. While all of these are great options, they also tend to have a high price tag. If you’re looking for a brand of pet food that offers a variety of formulas, uses high-quality ingredients, and won’t break your bank, Eukanuba dog food is an option worth considering. Since 1969 pet parents have been counting on Eukanuba to meet the nutritional needs of their four-legged family members. In this review, we’ll share more information about Eukanuba so you can learn more about this pet food manufacturer and see why so many pet parents feed it to their dogs. But first, we share what we consider to be the best formulas that this brand has to offer. Now that you’ve seen our selection of the top five Eukanuba dog food formulas, let’s take a closer look at each one. Below, we provide a more detailed overview of each option, including the ingredients that they feature, what we like about each formula, and what other pet owners who have used each option have had to say about them. After you read through the reviews and decide which option will is the best choice for your furry friend, click on the buttons to find the best prices currently available on Chewy and Amazon. Dry dog food is one of the most popular food options that pet parents choose to feed their canine companions. The dry kibble helps to keep teeth clean by removing plaque and tartar buildup with each bit, and most dogs find it satisfying. The fact that dry food is easy to serve is a major appeal, too: just pour it into a dog food container to keep it fresh and put the appropriate amount into your pet’s dog bowl. If you have an active adult dog and you’re looking for a dry food, Eukanuba Premium Active Adult Dry Dog Food is a great option to consider. It’s specially formulated to provide energy and promote lean muscle mass so that your pooch can sustain his peak performance. Active dogs require a high protein dog food, and this formula offers the highest concentration of protein compared to any other Eukanuba product. It also offers a higher fat content to further support energy levels. The first ingredient is real chicken. It also contains natural sources of glucosamine and chondroitin sulfate, two nutrients that support healthy joints. Other ingredients include easily digestible brewers rice, dried beet pulp, fish meal, and a bevy of essential vitamins and minerals. Most pet parents say that their dogs love the flavor. They also note that this food offers well-balanced nutrition. This kibble also features Eukanuba’s 3D Dentadefense System, which has been proven to minimize tartar buildup after 28 days. Final Verdict: Eukanuba Premium Active Adult Dry Dog Food is a fantastic option for high-energy adult dogs. It offers the perfect blend of nutrients to support energy levels, lean muscle mass, and joint health. However, do note that it contains byproduct meal and corn. Large breeds, like Rhodesian Ridgebacks, Mastiffs, and German Shepherds, have special dietary needs. That’s why it’s important to choose a specially formulated food for large dogs. Eukanuba Adult Dry Dog Food Chicken is made specifically for large dogs to ensure that they are getting the balanced nutrition that they need. It’s formulated with a specialized fiber system, which includes natural beet pulp and prebiotic FOS, to ensure that your pet is absorbing all of the nutrients that this food offers. It also helps to promote healthy digestion. Large breeds often suffer from digestive upset, so this formula can help to keep their tummies. The inclusion of naturally sourced glucosamine and chondroitin strengthens the joints, and omega 3 and omega 6 fatty acids will keep your dog’s skin healthy and his coat shiny and full. The first ingredient is real chicken for optimal protein levels. Other ingredients include ground whole grain barley, fish oil, flax meal, brewers rice, and nutrient supplements, like folic acid, vitamin E, zinc, and calcium. The majority of pet parents say that they are very happy with the product, and their dogs love the flavor, too. 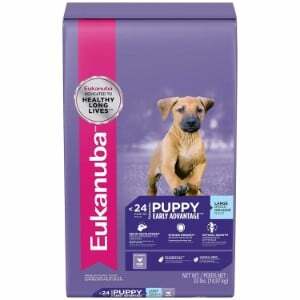 For large breed puppies, Eukanuba Puppy Dry Dog Food Chicken is an excellent option to consider. Veterinarians often recommend a puppy milk replacer for young canines, as it contains the essential nutrients that are found in a mother’s milk to ensure optimal development; but, with this formula, you can skip the milk replacer and ensure that your pup is getting the nutrients that he needs to thrive (as long as his teeth are developed enough to handle dry kibble). This puppy contains a precise blend of DHA, which has been sourced from fish oil, to support brain development in young canines. It also features a specialized fiber system, which includes beet pulp and prebiotic FOS to promote healthy digestion and ensure nutrient absorption. It also offers optimal amounts of high-quality protein and calcium to promote healthy joint and bone development. The kibble is smaller, too, which makes it easier for puppies to handle. Ingredients include real chicken, brewers rice, fish meal, and a variety of essential vitamins and minerals. Final Verdict: If you have a large breed puppy, Eukanuba Puppy Dry Dog Food Chicken will ensure that his nutritional needs are being met. It features calcium and DHA, two nutrients that are vital for puppies, and the fiber and prebiotics will allow your pup to easily digest this formula. If your dog is finicky and just won’t eat dry kibble, or if he has dental health problems and can’t chew dry kibble, feeding him a high quality wet dog food is an excellent option. Picky eaters find wet food more palatable, as it tends to offer more flavor and the texture more closely resembles the food that they would have eaten in the wild. And, since wet food is softer, it’s easier for canines that have dental health issues to chew. 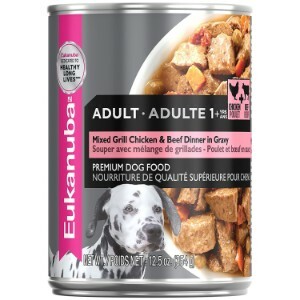 Eukanuba Wet Dog Food Adult Mixed Grill Chicken and Beef Dinner is a great canned food to consider for your pup. This formula contains high quality protein that has been sourced from chicken and beef. This not only enhances the taste of the food, but it also ensures that your adult dog is getting the protein that he needs to support his joints and muscles. It also contains the perfect balance of vitamins, minerals, fats, and carbohydrates to support his overall health. All ingredients are slowly stewed in gravy, which makes for moist, tender, and tasty morsels that your canine companion will love. The infusion of antioxidants will also help to ensure that his immune system is healthy so he can stave off infections. Most pet parents say that their dogs love the flavor of this food, and that they are very happy with the quality. Final Verdict: While some pet owners did complain about the smell of this food, it’s important to note that wet dog food does have a more pungent odor than dry kibble. That aside, given the fact that this formula is infused with essential nutrients that adult dogs need, and that it’s made with real chicken and beef, your canine companion will likely love the flavor of Eukanuba Mixed Grilled Chicken and Beef in Gravy canned dog food. 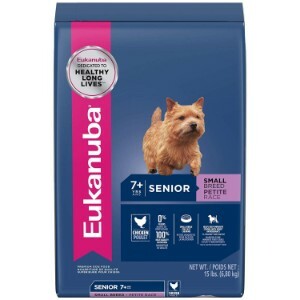 Last, but certainly not least, on our list of the best Eukanuba dog food formulas is their Senior Dry Dog Food. If you have a mature pooch, it’s important to make sure that you are feeding him a specially formulated senior dog food. Just like humans, the nutritional needs of canines change as they age, and with Eukanuba Senior Dry Dog Food, you will have confidence knowing that the nutritional needs of your mature pooch are being met. This formula is made for dogs that are seven years of age or older. It features a specialized fiber system that is comprised of prebiotic FOD and natural beet pulp for easy digestion and to ensure that your pup is absorbing the essential nutrients that this food contains. The infusion of antioxidants will help to keep your dog’s immune system healthy and strong, which is particularly important for older canines. Real chicken is the first ingredient, so you can be sure that your pup is getting the protein that he needs to support optimal lean muscle mass. The natural sources of glucosamine and chondroitin will also help to keep his joints strong, which is something that is particularly important for senior dogs, as they tend to develop joint issues like arthritis and hip and elbow dysplasia. It’s also fortified with other essential vitamins and minerals, like vitamin A, vitamin E, beta carotene, L carnitine, vitamin B12, and copper. The majority of reviews that we read indicate that overall, pet parents are very happy with this product. Final Verdict: When you feed your senior dog Eukanuba Senior Dry Dog Food, you will have peace of mind knowing that his unique nutritional needs are being met. This formula contains essential vitamins and minerals that senior canines need to support their overall health and well being. Your dog is more than just a pet; he’s a member of your family. Just like any other member of your family, you want to ensure that you are providing him with the best care possible. That’s why it’s so important to make sure that you are feeding him a high quality dog food that will meet his nutritional needs. Canines, just like humans, require the right type and the right amount of nutrients to support their overall health and well-being. For that reasons, veterinarians and animal nutritionists strongly recommend pet parents’ choose a high quality dog food from a reputable manufacturer. While there are a lot of very well regarded pet food makers available, if you don’t want to pay a fortune to feed your dog, but you still want to ensure that he is eating a well-balanced diet, you might want to consider feeding him Eukanuba. Eukanuba was created in 1969 by Paul Iams. The pioneer of this well-known pet food brand wanted to offer pet parents high quality, yet affordable food options that were made of the best possible ingredients to support overall health and nutrition of dogs of all ages and sizes. When Mr Iams was trying to select a name for the food that he was making, he wanted to choose something that was unforgettable and described the high level of his newly crafted dog food formulas. The name Eukanuba comes from jazz music. It was a word that was used in this genre of music to describe anything that was considered “top of the line” or “supreme”. He felt that this word perfectly describe his pet food, and he also thought that it was a very noticeable name that people wouldn’t forget. That’s why he decided to use it for his new line of food. Eukanuba dog food is founded on a simple nutritional philosophy: canines are instinctively carnivores, and as such, they should be fed food that appeals to their instincts. For that reason, only the highest quality animal proteins are featured in their formulas, such as chicken and lamb. Additionally, the makers of Eukanuba understand that dogs of different sizes and ages have different nutritional needs. For that reason, they create specialized formulas that are intended to support the dietary needs of all types of dogs. For example, their large breed dog food is specially formulated for large dogs, like Mastiffs and Saint Bernards, while their food for small dogs is meant to meet the unique nutritional needs of small breeds, like Shih Tzus and Pomeranians. In other words, when you feed your canine companion Eukanuba dog food, you can be sure that you are feeding him the highest quality food that will satisfy his needs. As we’ve already mentioned, Eukanuba uses the highest quality ingredients to ensure that the instinctual and dietary needs of canines are being met. Their food is also much more affordable than other pet food options. But those aren’t the only reasons why you should consider feeding your pooch this brand of dog food. Eukanuba has partnered with several important organizations in the pet food and pet care industry, such as the American Kennel Club and the Federation Cynologique Internationals. They are also “Partners of Excellent” with several highly respected kennel federations in Europe, such as The Kennel Club. 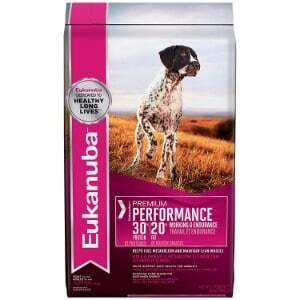 So no matter what type of canine companion you have, Eukanuba offers a formula to meet his unique nutritional needs. Furthermore, this dog food brand offers a 110 percent Satisfaction Guarantee. If, for any reason, you are not happy with any of their products, all you have to do is save the unused food, the original receipt that proves your date of purchase, and the UPC. You can then call 1-888-EUKANUBA (385-2682) with this information and they will the manufacturer will fully refund your money. (Do note that there is a limit of one refund per household). To help use choose the best Eukanuba formulas, we enlisted the help of veterinarians and animal nutritionists. Our team of experts reviewed the ingredients in all of the manufacturer’s formulas to decide which options would best meet the needs of the dogs that the majority of pet parents have. With the information we acquired, we were able to narrow down the choices to the five options listed in this review. No matter what type of dog you have, one of the formulas listed in our review will be able to meet his nutritional needs. 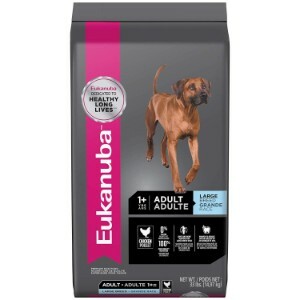 Eukanuba is a high quality, affordable dog food that uses the highest quality ingredients to support the dietary needs of dogs of all ages, sizes, and activity levels. When you choose this brand for your pup, you will have confidence knowing that he is getting the very best nutrition possible.